We Are Lake Norman & Mooresville, NC’s #1 Home Builders! Home Builders in Mooresville & Lake Norman – Lake Norman is a very popular place to build a getaway home or a permanent home. Many professional athletes own homes in the area, which makes property even more sought-after. 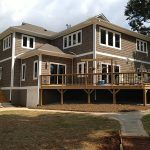 To keep the area clean, nice, and well maintained, a non-profit organization called the Lake Norman Home Builders Association has been formed to guarantee quality when you choose to build your home in this area. The Lake Norman HBA has a designated list of approved home builders in the Lake Norman area, and among them is the award-winning Chad Goodin Signature Homes. Our company was a top award winner after building a custom design home for NASCAR driver Michael Waltrip. Today, we are recommended as one of the top home builders in Lake Norman. With over 30 years of experience to back us, we serve the Lake Norman & Mooresville area with any home building need, large or small, and we can also renovate kitchens and bathrooms in your existing home. Our goal is to make your dream home a reality, and with our helpful, efficient, and well-disciplined crew, we make your project simple. We also promise to keep contact with you through the entire process to make sure you understand and approve of everything that’s going on. Your designs and imagination become our plans to make the impossible happen. From the beginning of the job to the end, you will receive nothing but the best service from our company. We ask you the questions and design what you want. As home builders in Lake Norman & Mooresville, let us create your dream home or your dream vacation home, exactly as you have always imaged it to be. At Chad Goodin Signature Homes, our home builders in Lake Norman proudly serve Mooresville, Lake Norman, Cornelius, Davidson, Huntersville and the surrounding areas in North Carolina.